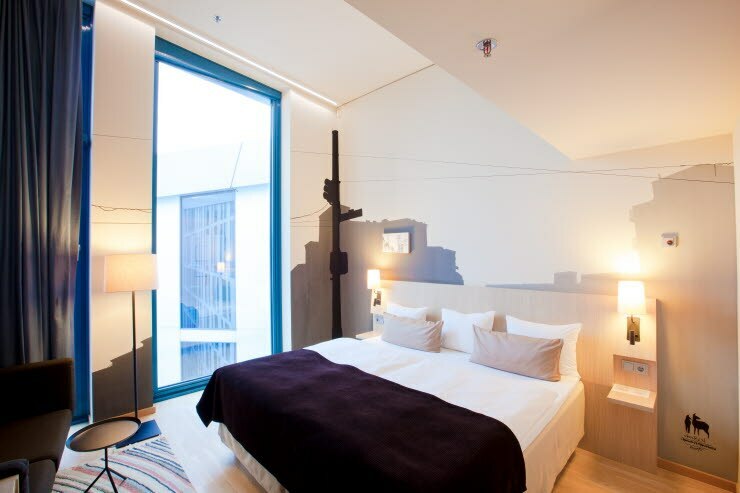 In superior plus room 707 you find yourself on the streets of San Francisco, recreated by the artist Christian Rothenhagen from Berlin in his delicate work. If you want to learn something about Christian Rothenhagen, you are best advised to ask the devotees of his art, those who exhibit his art or artists who work with him. What you see first of all is urban art, architecture that is made visible through Rothenhagen’s use of fineliners, marker pens, glue, cardboard, paper, MDF and even wood. But he shows far more than just an image of the street characteristics of Berlin or San Francisco. The city is the centre of our lives, the place where life happens. Rothenhagen depicts it sometimes with fine filigree lightness, other times with striking vividness, bringing all the facets of the metropolis to life, with the effect that the observer feels a part of this city that seduces souls, robs and loves. Irrespective of where his works are displayed, they create a sense of immediate proximity. It almost seems as if you are directly in the city on the Spree or looking at the Golden Gate Bridge.